There is a nice and cosy town called Elva 25 km southwest from Tartu. It's like Nõmme area in Tallinn: many private houses in pine forest. I have posted some photos already in post nr. 38. During the years I've wanted to go and see more of them. I went to see an area where I had never walked before. From the beginning of 1990's, there are similar in Põlva and other places. This house could have been yellow even before renovation. 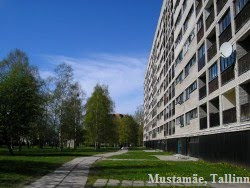 This is something that people will see if they come from Tartu. I wonder what is up there? Doesn't look like apartments. But 3 floors worth of space for an attic? There is a similar house in Põlva, except without the upper part. Good old. Many may have childhood memories here but after renovation this place, it probably won't let recall that many of those memories anymore. This photo is kind of perfect. Only the modern car plate reminds the change, but other than that, it may well have been taken in soviet time. Broad view from the windows, just like in Luunja. This is a bit out of Elva. Looks like a nice place.